If you spot any burrs in your dog's coat after he spends time outdoors, remove them with your fingertips. Burrs are spiky seeds found on many plants. Not only can burrs cause pain and skin irritation in dogs, but they can also bring on possible infections if they implant in their skin. His paws may hide painful burrs. If your dog has just gone outdoors for a walk or play session, carefully examine his fur and paws as soon as he gets back inside. Burrs are prickly and frequently attach themselves to pets' coats. If you spot any burrs, take them off gently with your fingers. Extract them by making gliding outward movements, or use tweezers or a metal comb to pull out the burrs. Be thorough when you examine your pet's coat for burrs. Look below your pets' legs, behind his ears, in his genital area and on his footpads, where burrs sometimes hide. Wear gloves to protect your own hands, too -- prickly burrs can easily stick to your skin. Some burrs are persistent and don't budge easily. If there are mats in your dog's coat, carefully undo them using your fingers. If the mats are severe, use a special dematting comb. Look for one that features curved edges for extra safety. A little lubrication might help with stubborn burrs, too. Put between 10 and 20 mineral oil drops on them. Cornstarch, vegetable oil, olive oil, detangling spray and coat conditioner also might help soften burrs' spiky textures and make your dog's coat looser so removing the burrs is easier. 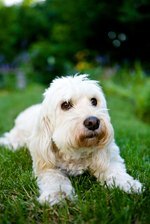 Keep these substances out of your dog's ears and eyes to avoid irritation. If you're not able to get burrs out of your pet's coat easily and quickly, or if there are excessive numbers of them, contact your veterinarian for help. Fussy burrs trapped in pets' coats sometimes need to be cut out with scissors. If you think this might be the case with your canine's burrs, notify your veterinarian of the situation immediately. You don't want to risk injuring your dog with the scissors, especially if the burrs are located in particularly vulnerable spots on his body. Your veterinarian can help you get the burrs out safely and efficiently. She also might be able to suggest a reputable and highly experienced professional groomer for the task. Swiftness is critical in burr removal situations. If you allow burrs to remain in your pet's coat, they can migrate deeper into his fur, where they become more complicated to remove. If you use cornstarch, mineral oil, olive oil, vegetable oil or any other doggy-safe substance to make removing the burrs from your dog's hair easier, bathe him immediately afterward with shampoo formulated for dogs. If your pet's hair is particularly greasy, try a canine degreasing shampoo, followed by a calming conditioner or rinse. Comb him to ensure no burrs remain, paying special attention to the areas where burrs tend to hide.